If you're a fan of Arizona history, you've heard of the Lost Dutchman mine. People are still looking for it, and it's supposedly in the the Superstition Mountains near Apache Junction, Arizona, which is east of Phoenix. Legend has it that it was the greatest gold mine in the area, with huge chunks of gold, right there, just for the taking. 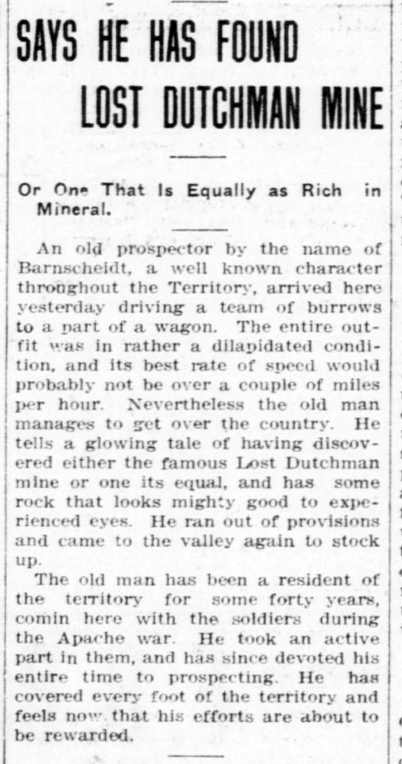 1909 article about the Los Dutchman mine. According to the story, the mine was discovered by a man named Jacob Waltz, who was born in 1808 and died in 1891. 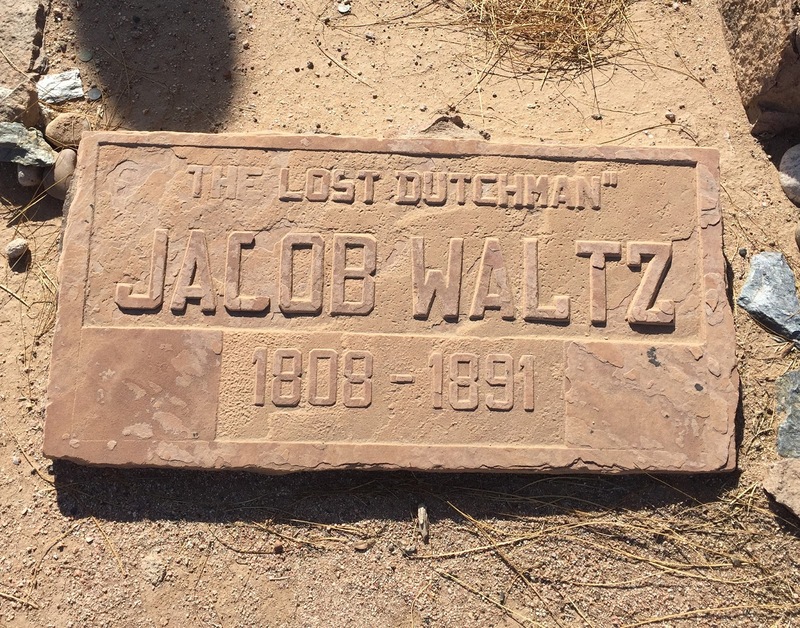 And whether his fabulous mine ever existed no one knows, but Jacob Waltz did exist, and he was one of thousands of people who mined for gold, silver, and other precious minerals around the Phoenix area. 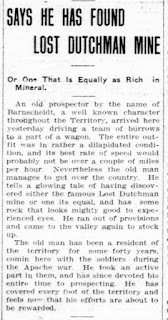 Since his mine was considered lost, it was named after what most people called him, "the Dutchman" and the mine was called the Lost Dutchman mine. 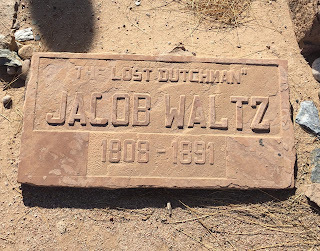 So Jacob has been called the Lost Dutchman. Of course, it was his mine that was lost, not himself, but that's the confusing way that the language works. And for you serious trivia fans out there, Jacob wasn't even Dutch, he was German. That is, Deutsch. But if you're not careful with pronunciation, it can easily sound like the word "Dutch", so Dutch stuck. He was really a Deutsch Man, you know, as in Deutschland, which is Germany. If you Google Deutschland, you'll see that it's Germany. Enough trivia already. The point here is that he wasn't lost. He's right in Phoenix. 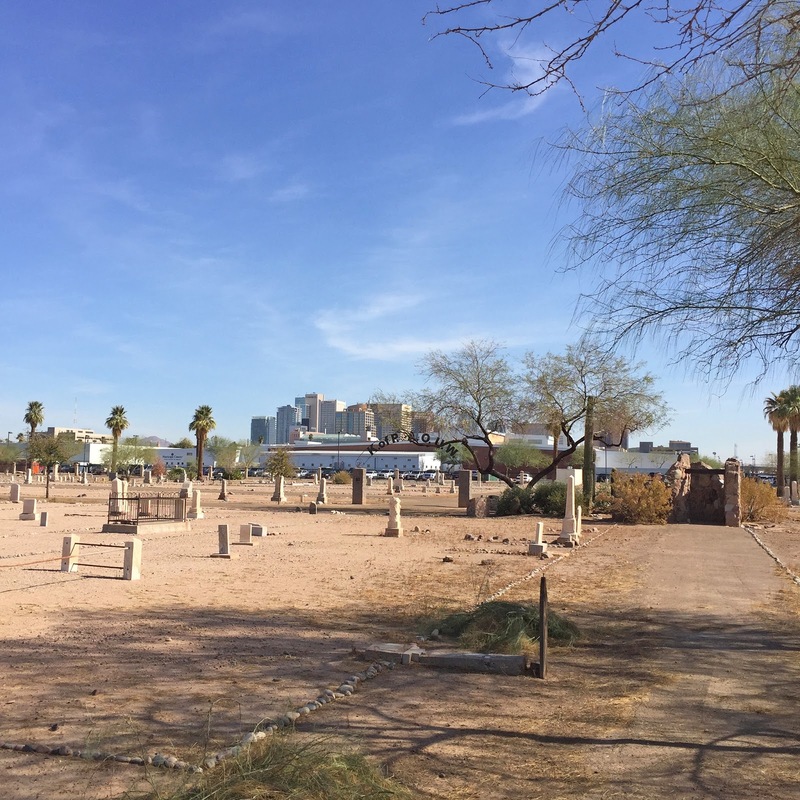 Well, he's buried there, in the Pioneer and Military Memorial Park at 13th Avenue and Jefferson. 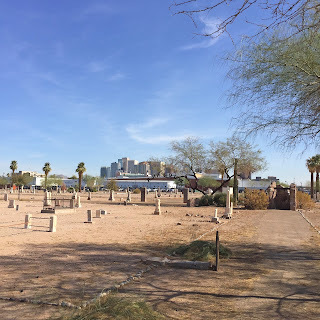 The Pioneer and Military Memorial Park, 13th Avenue and Jefferson, Phoenix, Arizona. You're looking east towards downtown. I was wandering around there today, and was very impressed by how neatly kept the volunteers keep the place. They're the Pioneers' Cemetery Association, and they meet in that cool old house that you see right there. Just go there and say "I want to see the Lost Dutchman" and someone there will know what you mean. If you ask to see where Jacob Waltz is buried, they'll be more impressed. You can say that Brad sent you, but that probably won't impress them. And no, there are no photos of him, although many people claim it. 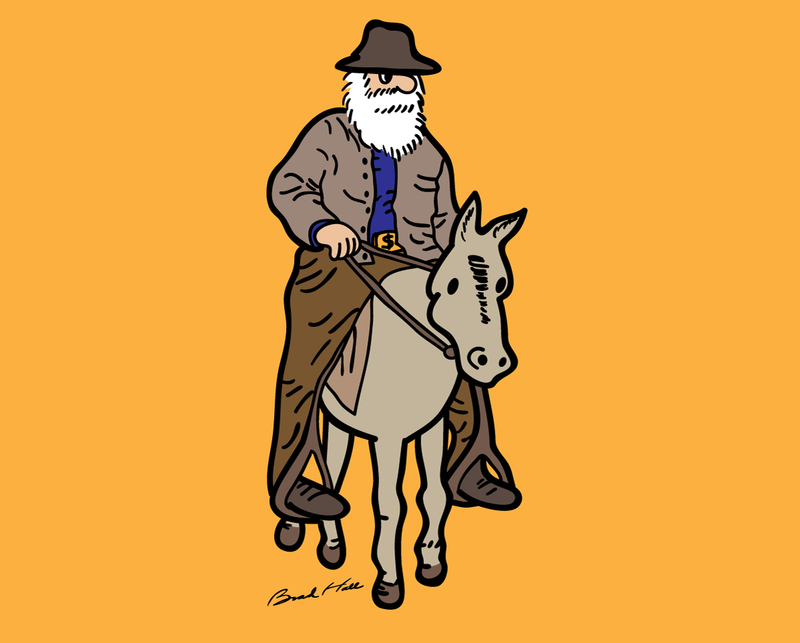 And it stands to reason, he was just an ordinary man digging for gold in the Salt River Valley. And like all wise people who look for gold, he was secretive. I can't imagine him ever going somewhere to have his picture taken. Nowadays he probably wouldn't even use a cell phone. 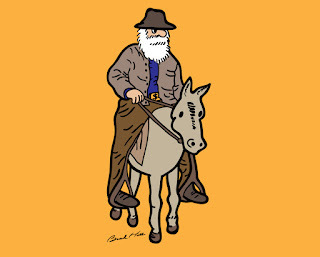 Cartoon of the Lost Dutchman. Probably as accurate as any other image of him.